The fact that I purchased this quilt in a dark little antique store in Burlington Square in Burlington, Vermont does not make this quilt an antique. Many things sold in antique stores are merely old. What does make this antique is the fact that every single piece of fabric on the front is from most likely the 1940s according to Allen Fannin (my former partner) who taught the business aspects of Fashion at Syracuse University until his tragic death in a head on car collision. 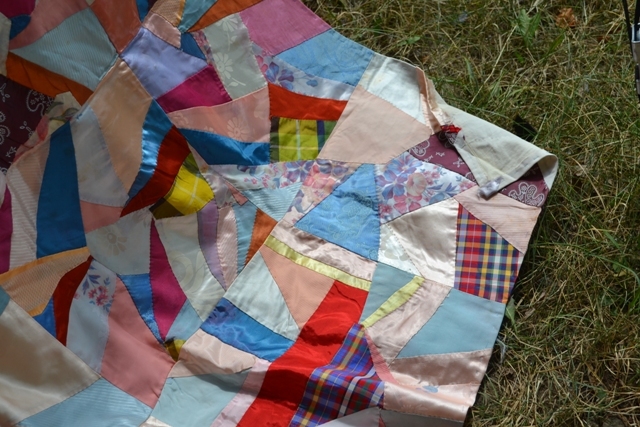 What makes this quilt interesting is that every single square is hand pieced. Quite a few of the blocks are put together by hand, but some are also machine stitched. I don’t think that detracts from its charm at all. There is a very definite pattern to each square. 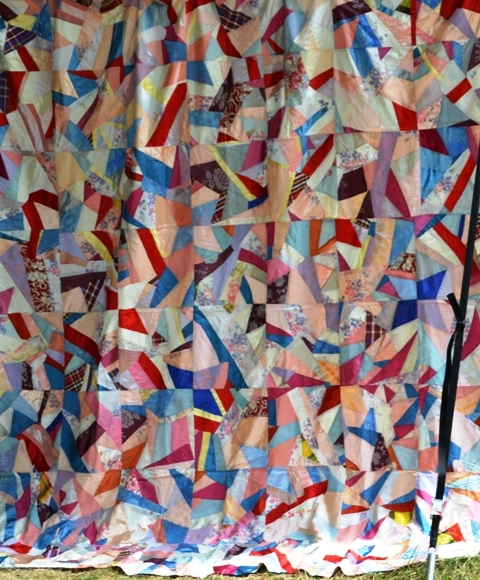 The quilter used a four pointed star for the basis of each block. Then the 12½ inch squares were filled in. All 56 of them! It has been suggested that the fabric came from either dresses, shirts, or robes. Can you see the shine of the fabrics? 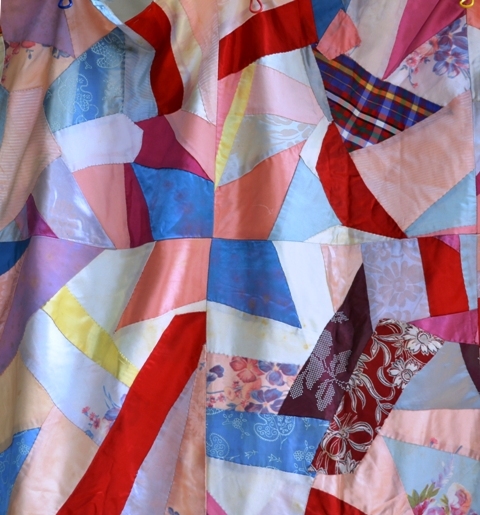 What makes this an “Almost Crazy Quilt” is the fact that there is not a single stitch of surface embroidery on it. That’s why I bought this little beauty. My plan was to do the embroidery and finish it. The question is where do I start? What do you think? All suggestions are more than welcome! 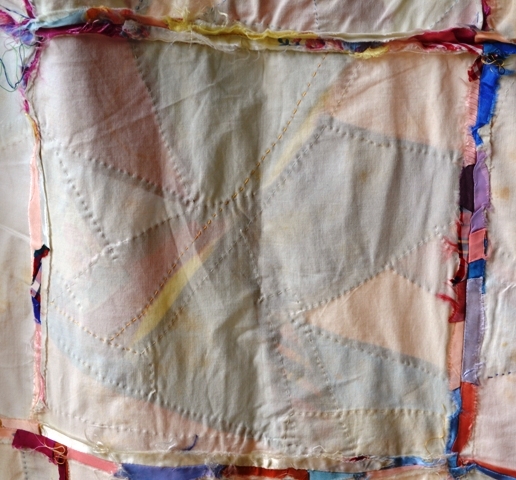 A reader, Susie, is looking for info on working with silk gauze. I am still looking for the specific article in my stash of the American Needlepoint Guild’s Needle Pointer for a specific article I remember seeing. I have also found this little blurb from Shakespeare’s Peddler. And I found a tutorial by Janet Granger on mounting silk gauze for miniature needlepoint. And Mary Corbet can always be counted upon to have tips and tutorials, even for working with silk gauze! You’ll find Mary’s tutorial on transferring patterns to silk gauze here. She has several other posts about the topic as well. Even About.com has info on working with silk gauze. If anyone else has any tips that might help Susie, comment away! Susie, it would be helpful if you describe the problem you’re having to help direct comments. Unless you found some help over at Stitchin’ Fingers. By the way, I’ve added some sayings to the “Sampler Sayings” page.